Well, tech giants like Google, Facebook & Microsoft have bug bounty programs in which security researchers were rewarded for disclosing existing flaws in the system. If we take a look at search giant Google, the previous year, Google has released a report which throws lights on how hackers were rewarded $3 million throughout 2016. A few days ago we have seen a high-school student from Uruguay has been rewarded with $10,000 after he managed to discover a vulnerability in Google. So, it looks like the search giant is willing to reward some good amount to security researchers. 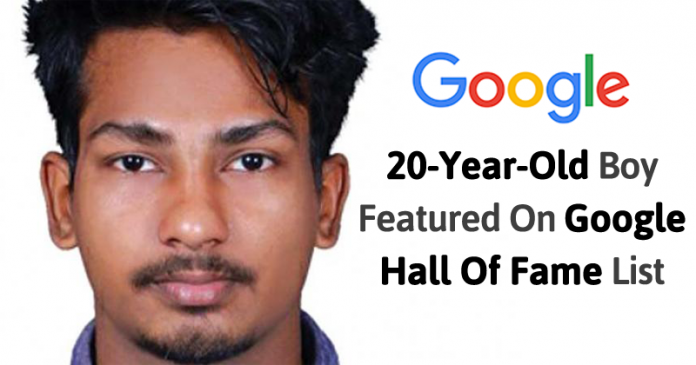 Now, a twenty-year old from Kozhikode, Hariprasad T was featured on the 49th page of Hall of Fame list. Mr. Hariprasad was a third-year computer engineering diploma student at Government Polytechnic College. He managed to fix his spot on the 49th page of 89-page Hall of Fame list after finding the fault in the sub-domain of Google. Hariprasad described himself as a self-taught, he said that he likes to spend time on the internet after his college hours just to gain some knowledge in technical aspects. He also works part time to support his family and fund his studies. He keeps huge interest in technology section which pushes him to learn it by himself. He said that he has received the email from Google regarding his entry into Hall of Fame on Thursday. The reward would be announced within two weeks. So, what do you think about this? Share your views in the comment box below.